We’d love your help. 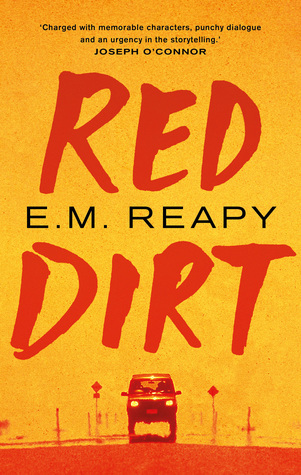 Let us know what’s wrong with this preview of Red Dirt by E.M. Reapy. A gripping tale of loss and hope, of self-destruction and self-acceptance, from an exciting new debut author. Three young Irish people have come to Australia, running from the economic ruins of their home country and their own unhappy lives. In this promised land, stunned by the heat and the vast arid space of the interior, they each try to escape their past in a chaotic wo A gripping tale of loss and hope, of self-destruction and self-acceptance, from an exciting new debut author. Three young Irish people have come to Australia, running from the economic ruins of their home country and their own unhappy lives. In this promised land, stunned by the heat and the vast arid space of the interior, they each try to escape their past in a chaotic world of backpacker hostels, huge fruit farms and squalid factories, surrounded by new friends who are even more damaged and dangerous than they are themselves. Endless supplies of cheap drink and drugs loosen what little sense of responsibility they have, and a spiral of self-destructive behaviour forces each of them to face up to the reality of their lives. To ask other readers questions about Red Dirt, please sign up. IS THE BOOK AVAILABLE TO BUY YET? AM EAGERLY LOOKING FORWARD TO IT. Red Dirt is a novel about three young Irish migrants, Murph, Fiona and Hopper, who have moved to Australia in the hope of finding a better life. They live in youth hostels and spend their days looking for work in factories and on farms. All three make mistakes throughout their journey, come across one another and are eventually brought together with tough decisions to make. I enjoyed this book because of the interesting characters and also because how Reapy structured it into three sections: the Red Dirt is a novel about three young Irish migrants, Murph, Fiona and Hopper, who have moved to Australia in the hope of finding a better life. They live in youth hostels and spend their days looking for work in factories and on farms. All three make mistakes throughout their journey, come across one another and are eventually brought together with tough decisions to make. I enjoyed this book because of the interesting characters and also because how Reapy structured it into three sections: the first being told in first person by Murph , the second in second person by Fiona and the third in third person by Hopper. I liked Fiona's section best as second person writing is unusual and out of the three she was my favourite character due to her bravery. A smart, confident dissection of the Irish Recession from an angle which has remained largely unexplored, Red Dirt tells the story of three Irish youngsters who have been forced to emigrate as a result of financial upheaval. Set among backpackers in the Australian outback, it would be tempting to think of this as being like Alex Garland's 'The Beach'. However, the three distinct voices made me think of Donal Ryan, the ear for dialogue of fellow Mayo-nian Colin Barrett, and the talent for suspense A smart, confident dissection of the Irish Recession from an angle which has remained largely unexplored, Red Dirt tells the story of three Irish youngsters who have been forced to emigrate as a result of financial upheaval. Set among backpackers in the Australian outback, it would be tempting to think of this as being like Alex Garland's 'The Beach'. However, the three distinct voices made me think of Donal Ryan, the ear for dialogue of fellow Mayo-nian Colin Barrett, and the talent for suspense of Claire Keegan. This book was not for me! This book has had countless great reviews and has been shortlisted for awards but I just did not feel any empathy to the characters at all. It is cleverly constructed, the 3 central characters, Murph, Fiona and Hopper, all tell their story in 3 separate parts. They are all young and Irish and have travelled to Australia to escape the Irish recession. Each story comes together at the end and shows how each of them have had to deal with their own demons and are trying to fi This book was not for me! Each story comes together at the end and shows how each of them have had to deal with their own demons and are trying to find answers in a new country when their own homeland has failed them. However, from my own point of view I just could not understand how drinking to excess and taking copious amounts of drugs was a solution to anything especially as they never had any money and as soon as they managed to get some it was immediately swallowed up by their excesses. I am also not a fan of excessive swearing and although I appreciate that this is probably a true reflection of how these characters would speak in their situation I just did not like it. Book reviewing to me should be honest and impartial and that is why I have not praised this book however I am sure that it will appeal to many other readers but it was not for me!! An oblique look at the fall-out from the financial crisis and recession in Ireland, Red Dirt follows the (mis)fortunes of three victims of the crash - each of them losers in their own way - as they move around the backpacker hostels, mango farms and garlic factories of Australia, leaving a trail of destruction in their wake. Some of the voices perhaps work better than others and the story just occasionally treads water. But the characterisation is vivid, the dialogue is pithy and demotic, and th An oblique look at the fall-out from the financial crisis and recession in Ireland, Red Dirt follows the (mis)fortunes of three victims of the crash - each of them losers in their own way - as they move around the backpacker hostels, mango farms and garlic factories of Australia, leaving a trail of destruction in their wake. Really liked this up until about half way through. Then I began to lose interest in the characters and the demons they had. Loved the way it was constructed but by the third 'act' I couldn't care less about the characters any more. They were too same-y, doing pretty much the same thing (drink/drugs/fruit (is garlic a fruit?) picking) and running from one place to the next with no inkling of hope. Shame really, really liked the start. I was caught from the start. I initially suspected it was going to be set in the past but it's right up to the minute and the way it describes people's different experiences of days together or crossing each other is what caught me. I really liked the parts where people ended up in danger and was never sure if they'd make it or not. I read some of the reviews were likening the read to something similar to Trainspotting and I guess there's an element of that, having not seen the film or read the book I'm unawares. I do have experience of the trails that the people in the book go through and I loved how there were those who had gone through similar events who helped others going through it with instructions to pay it forwards in future. The only thing that lacked real believability to me was how accepting the parents of the girl were to her lack of communication but if that's all that I struggled with it's definitely a good book for me! There have been quite a number of books written about the immigrant experience but none as fast-paced and riveting as Red Dirt, a debut novel by E.M. Reapy, which tells the story of three Irish people escaping their recession ravaged country to find a better life in Australia. The story is told in three parts (Me, You & Them) from the point of view of Murph, Fiona and Hopper who are unknown to each other until their lives intersect while backpacking around Australia. Read the full review at W There have been quite a number of books written about the immigrant experience but none as fast-paced and riveting as Red Dirt, a debut novel by E.M. Reapy, which tells the story of three Irish people escaping their recession ravaged country to find a better life in Australia. The story is told in three parts (Me, You & Them) from the point of view of Murph, Fiona and Hopper who are unknown to each other until their lives intersect while backpacking around Australia. Definitely got The Beach/Trainspotting vibes with some Wolf Creek. Great voice. What generally attracts me to Irish literature is the pervading sense of dread, often desperation, that is portrayed in fluid, eloquent, often stylish prose. This was the case in Reapy's debut novel. However, the three main characters of her three sections - "Me", "You" and "Them" - drag the sadness and failures of their young lives in Ireland with them to Australia. As readers, we become immersed in their mistakes, in their flaws and hopelessness, both hating and loving them as they struggle to What generally attracts me to Irish literature is the pervading sense of dread, often desperation, that is portrayed in fluid, eloquent, often stylish prose. This was the case in Reapy's debut novel. However, the three main characters of her three sections - "Me", "You" and "Them" - drag the sadness and failures of their young lives in Ireland with them to Australia. As readers, we become immersed in their mistakes, in their flaws and hopelessness, both hating and loving them as they struggle to untangle themselves. I so admired the writing of this new author. The Irish lilt and rhythm of their dialogue sounded loudly against the Australia outback described so vividly through the landscape and people the three encountered. Here again, the Australian desert landscape was projected as threatening, a familiar convention even in our own Australian film and literature. One particular scene of magic realism was fascinating to read: a kangaroo "husband and wife" converse with the most troubled of the three characters in the desert and provide him with clarity about life's choices. Following this, the same character is rescued in the Nullabor by an Aboriginal man, Reapy's subtle introduction to Australia's own historical conflict of its past. This is a tale of three Irish youngsters who have left Ireland for pastures new in Australia - their past and their trials, tribulations and mishaps in Australia, often caused by their own behaviour, attitudes and history. The book is in three sections - Me, You and Them. In 'Me' we meet Murphy, staying in a backpacking hostel in Perth with his friend Shane but soon to be travelling to the Outback to work on a mango farm. They get a new acquaintance, Hopper, to tag along with them - but when Hopp This is a tale of three Irish youngsters who have left Ireland for pastures new in Australia - their past and their trials, tribulations and mishaps in Australia, often caused by their own behaviour, attitudes and history. The book is in three sections - Me, You and Them. In 'Them', we get Hopper's backstory and learn what happened to him prior to and after his abandonment in the desert, which leads back to a confrontation with Murphy and Fiona. fast paced tale of three young Irish emigrants to Australia - Fiona, Murph and Hopper – divided into three linked sections, out of chronological order, told from three different perspectives (first person, second person, third). a tale of consequences, as the result of bad decisions, drugs and alcohol and poor luck. first section's characters, the two lads, are almost fast paced tale of three young Irish emigrants to Australia - Fiona, Murph and Hopper – divided into three linked sections, out of chronological order, told from three different perspectives (first person, second person, third). Contado de forma muy sencilla y como bastante slang y palabras gaélicas nos cuenta la historia de tres personas cuyas vidas se cruzan en un momento crítico. Me he bebido el libro a tal velocidad que el final me ha resultado soso. A medida de lo que podía llegar a pasar pero, soso. Una pena porque las dos primeras partes y el principio de la tercera me han gustado mucho cómo se iban desarrollando y cómo se desenvuelven las personalidades de cada uno de los protagonistas de manera tan característic Contado de forma muy sencilla y como bastante slang y palabras gaélicas nos cuenta la historia de tres personas cuyas vidas se cruzan en un momento crítico. Me he bebido el libro a tal velocidad que el final me ha resultado soso. A medida de lo que podía llegar a pasar pero, soso. Una pena porque las dos primeras partes y el principio de la tercera me han gustado mucho cómo se iban desarrollando y cómo se desenvuelven las personalidades de cada uno de los protagonistas de manera tan característica. A raw and engrossing story about down-on-their-luck Irish emigrants backpacking in Australia. Reapy does a good job weaving storylines and points of view together, all of which are powerful, particularly the garlic factory and the road trip Hopper and Norman take together. It's easy to see how even halfway around the world the past catches up to characters fleeing the fallout of a recession back home. I have to be honest and admit I only bought this book as I liked it's title and artwork but I fell in love with the story almost from page one. This tale of young Irish backpackers in Australia is in equal turns hilarious and heart wrenching but never anything less than engrossing. I've seen other reviewers mention that this book is part of a series but you would never know it as I didn't pick up on anything that hinted at a previous book. At first I thought this book was too blokey, too lairy for my taste but it drew me in. It describes a seedy lifestyle and culture who h is thankfully alien but does it well. I would never have guessed that the writer is a woman. I loved it, I read the first 2/3s of the book in two days and then got too busy to read anything before finishing it again when I got a chance a few weeks later. As a young-ish man from the west of Ireland I found the characters very relate-able and the stories were very compelling. The way the book is written adds to the intrigue of the characters and their parts in each others differing lives. The conclusion ties everything together just enough to be satisfying, but I still wanted a continuation on the characters paths. This book is definitely one of my favourites that I've read this year. Wrapped up a bit too neatly. First half of book was a page turner, but then it became more of the same. Loved it. At first I wasn't sure if I could relate to the characters but I pretty quickly grew to love/hate them for their strengths and flaws. A fantastic read and a great story by a new Irish writer. A little violent in places, but exciting characters very well-drawn. Most interesting internal dialogue I have read in a long time. The book is a page turner. I was sorry this book ended. I was so caught up in the lives of the young people from Ireland and their travels in Australia that I wanted more. The writing is vivid and realistic and I loved it. Dreadful story about the adventures of young Irish emigrants in Australia .